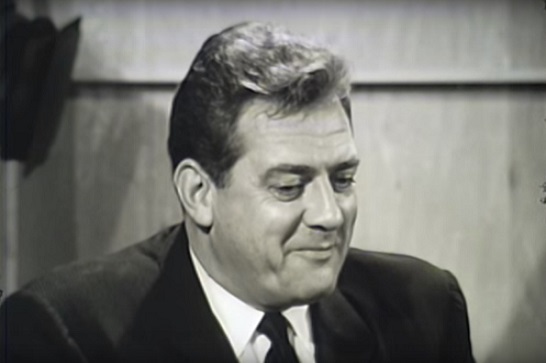 The actor Raymond Burr was born "Raymond William Stacey Burr" on May 21, 1917 in New Westminster, BC, Canada. He spent part of his childhood in China, where his father was a trade agent, and after his parent's divorce, the family moved to Vallejo, California. One of his first jobs was working as a ranch hand and a photo salesman to help support his mother and younger brother & sister. He also spent two years in the Navy during World War II, and then returned home after being wounded in the stomach on Okinawa. In 1937, he began his acting career in California at the Pasadena Playhouse and in 1941, he landed his first Broadway role in “Crazy with the Heart”. He had roles in over 60 movies between 1946 and 1957, and received favourable notice for his role as a prosecutor in "A Place in the Sun" in 1951, which co-starred Elizabeth Taylor and Montgomery Clift. Perhaps his best-known film role of that time was as the "heavy" in the Alfred Hitchcock classic "Rear Window" (1954), starring James Stewart and Grace Kelly. During this time, his distinctive voice could also be heard on network radio, appearing alongside Jack Webb in the short-lived "Pat Novak for Hire" on ABC radio, as well as in early episodes of NBC's "Dragnet". Burr actually emerged as a popular TV character actor in the early to mid 1950's and made his guest-starring television debut on an episode of "The Amazing Mr. Malone". This part led to other television roles in such programs as "Dragnet", "Chesterfield Sound Off Time", "Four Star Playhouse", "Mr. & Mrs. North", "Schlitz Playhouse of Stardom", "The Ford Television Theatre" and "Lux Video Theatre". In 1956, he obtained the role of lawyer Perry Mason, and this role is the one with which he was the most closely identified throughout his career, and is the role in which I remember him from my childhood. Although he remains one of the few actors who had a successful acting career playing two Lawyers on TV, as he also played "Ironside" which was on television in the UK as well as in North America.